About Us – WELCOME TO MAROONED ON MARCO ISLAND! We are Joe and Jennifer West and we work and reside in Scituate, MA but live in Marco! We purchased our little piece of paradise in 2007 and it was the second best decision we ever made (first was getting married). Our goal is to some day be snowbirds and enjoy our winters in Marco Island and our summers back in MA. Joe is a firefighter in our hometown and also has a second job working at a company that does private dock construction and full service mooring work, http://www.aquamarineservices.net http://www.steamboatwharfmarina.com He loves the water and boating and we hope to have our own boat on Marco Island someday and find new beaches every week! Jennifer is self employed and owns a body treatment business, Perpetual Motion Body Improvement Center, http://www.wefightcellulite.com in Quincy and Scituate, MA. 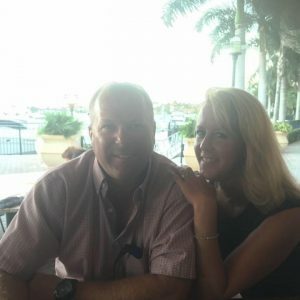 She also is a Realtor and works for Jack Conway & Co., Inc.
We are lucky enough to visit our condo and Marco Island about three to four times per year. We continually improve the condo and address the needs of our renters We are positive that you will have a great experience. Come find out why Marco is the place to go!